Therapist as Life Coach - Description | W. W. Norton & Company Ltd. The first edition of Therapist as Life Coach, published in 2002, anticipated this trend, and since its publication it has become a standard for therapists who wish to transition or expand their practices into life coaching. 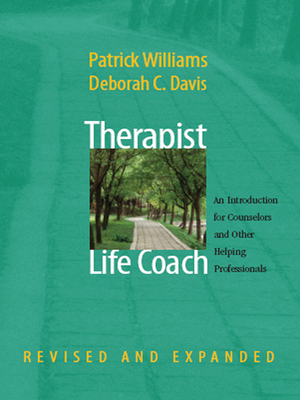 Pat Williams and Deborah C. Davis have finally revised their classic practice-building book for today's therapists and future coaches. Every chapter in this second edition has been updated and rewritten, reflecting the growth of the coaching field and its increasing appeal to not only therapists, but all helping professionals. The book begins by exploring the history of the coaching movement and shows how society is hungry for life coaches. The second part of the book explains in detail the differences and similarities between coaching and therapy, discusses the coaching relationship, and considers some of the skills therapists will need to learn and unlearn in order to reclaim their joyfulness about their work. Professional transition tools such as developing and marketing your practice and honing your coaching skills are discussed at length in Part Three. The final section moves beyond basic life coaching to introduce coaching specialties such as corporate coaching, offers self-care strategies for life coaches, and peeks into the future of life coaching. There is new material throughout, including an overview of recent coaching developments, updated liability concerns, new business opportunities, and a new section on the research about coaching. Coaching gives practitioners the opportunity to break free of managed care and excessive reliance on the insurance industry and to work with a wide range of clients—specifically, those who are not suffering from mental illness but, rather, seeking to maximize their life potential. This book will help you enter this lucrative and personally enriching world with the skills and knowledge you need to build a successful coaching practice.